Healium: Holiday Yoga at Healium! Hey, all! Some news to bring you up to date on our holiday yoga schedule. We love our yoga but we also love some time off traveling and catching up with family. 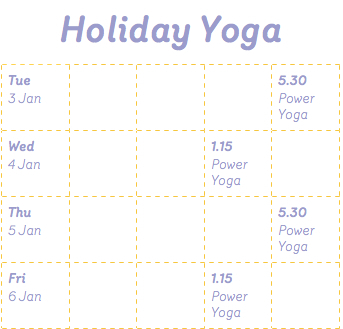 Then, on Monday, 9 January 2012 we're back to our full Yoga and Movement timetable. Special hold on concessions. Normally our concessions run for four consecutive weeks, but if you get your next one before Christmas we'll put a hold on it for any time you're away until you return in January. New Year membership - limited time offer! Through 22 December you can buy a three-month membership that runs after the holiday concession! Lock in the frequency and price point that work for you AND get one private yoga lesson or Thai yoga massage equal to the number of classes you take each week - with the 3-classes-per week membership you get 3 yoga lessons or massages free - a $300 value! Gift vouchers. These are available for yoga as well as all our offerings, starting at only $40. Ask us for details! Have a great rest of the year as you get ready for the holidays, and we'll see you soon!